How To Build a Strong Online Reputation? Reputation is everything. Even in the offline world you can make it or break it by just small decisions that you make. With the speed of the online world this influence is even bigger, so if you make mistakes they can be fatal. Also for the search engines, reputation is a strong measure point. If people talk nothing but bad about you, all over the internet, your reputation will get worse. Google will see this and take it in consideration while showing someone ‘the best results’. Even the smallest bit of ignorance can have catastrophic consequences for your reputation. That’s one of the many reasons why you should continue to work on your online reputation every day! 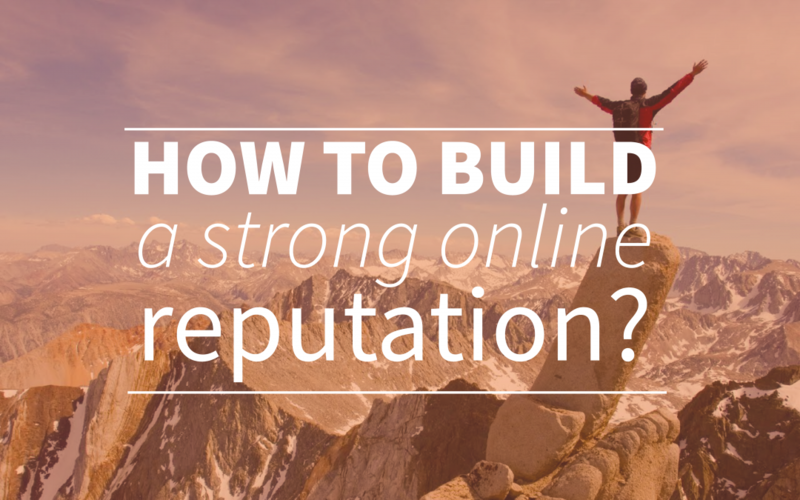 Want to know how to keep up your strong online reputation? We’ll give you 6 simple tips that will help you to control it as good as you can! Make sure that your website is clear and professional. People should be able to trust your website and a clear design and structured content will help them to see that this website is valuable to them. And a valuable website means a good online reputation! Think about what you want to share with and to express to your audience and try to communicate this in the best way you can. Make sure that you’re present online by regularly showing your expertise about specific subjects. This is something you can do in many different ways; by answering some ones questions, sharing interesting content, writing about specific subjects, discuss with other experts etc. This way people in your discipline will see you as a opinion leader and your reputation will grow with your number of supporters. Publishing valuable content about relevant subjects builds in many different ways on your reputation. People will be able to find your website faster if you manage to rank higher in search engines with your articles. They will see you as a opinion leader and link to your articles on their own websites, blogs or social media (which is also an important aspect of SEO). Also, people will know what they’re dealing with. If you constantly post new articles, they will have a reason to come back to your site. They’ll be able to know what or who they’re dealing with. Google also gives value to sites that publish new content on a regular basis, so if you’re lucky you’ll be able to show your expertise, work on your reputation and your SEO at the same time! If you manage to build a strong relationship with your audience, your online reputation will grow too! It’s harder to talk bad about something that you really feel connected to. So if something goes wrong with the service of a company you like, you’re more likely to forgive them. This is great if you want to build a strong online reputation, because it makes it easier to keep the people happy. How do you build a strong relationship? This is something you can do in many different ways. For example, you have Coca Cola, people just connect to the brand because it’s just always there. A good first step would be to take people seriously and listen to their needs and wishes. Your employees are the representatives of your company, so it’s very important that they are proud of their company and know what kind of behavior online and offline expected of them. If even your own employees are complaining about the products you sell, it will give a negative influence on the companies reputation. You could compare this situation with a supermarket employee that tells to all his friends that their products actually are quite bad and he likes to go to another supermarket. This way his friend will keep this in mind every time they need to make a decision which supermarket to visit. This gives a very bad image of his own company and influences the reputation in a very bad way. So make sure that everyone of your employees knows that even on their own Facebook page in a ‘private’ situation, speaking badly about the company is not done! Like we said before, even the smallest ignorance can lead to catastrophic consequences. Make sure that you keep your eyes open for bad reviews, complains about you or your product, comments about your actions etc. Some might seem not so important but you really should consider your options for every one of them. Are you going to ignore the comment? Or are you going to react? And how? Do you give them a new product or a compensation? Do you change something you’ve written that offended them? Do you apologize or do you stay with your opinion? Every one of these questions are just as important to think about. That’s what we mean with keep your mind open. If you decide to ignore an important complain, your online reputation might drop dramatically if the customer decides to spread his complains through social media and hundreds of people read this. Even if the complains aren’t public, like support mails, think about the powerful position that your clients have. In just a few minutes they can share their negative (or also positive) experience with hundreds of people. Use this in your advantage, take care and maybe they will give your online reputation a boost by posting something positive about your service. If you keep these tips in mind, you’ll be able to control most of the aspects that influence your online reputation. The last tip, ‘keep your eyes and mind open’, is also the most important one. The key to a successful online reputation is detect (in time) and react (the right way)! Do you have some useful online reputation tips of your own? Please share them with us on twitter @webtexttool! If you want to learn more about the technical aspects of creating an audience for yourself, you should take a look at our free webtexttool trial. It will help you to optimize your own content the right way, without any trouble! You could also read the best SEO whitepapers!